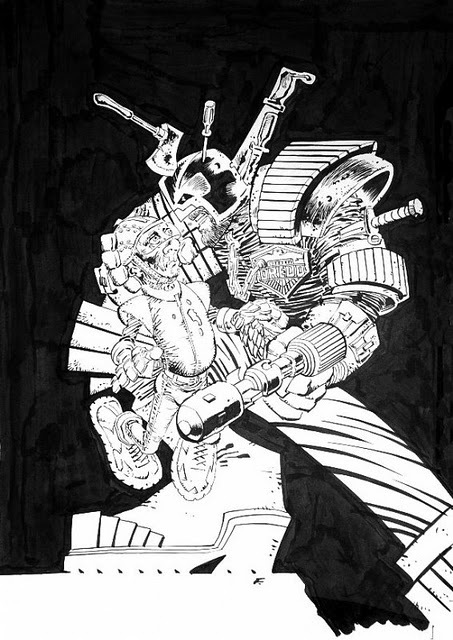 What Kev Walker's artwork looks like here, though, has much less to do with Miller than with Hellboy-era Mike Mignola and Dave Stewart. See, for instance, the image of the New New Kremlin below: almost nobody but Stewart uses that particular palette that much! "Sin City" is an attractive story, consistent-looking, a reasonably suspenseful thriller with a big multiple-pronged payoff. John Wagner's clearly having some fun writing it (not least because it lets him write a bunch of scenes of people enjoying the opportunity to do horrible things: "For our entree, we will be serving slices of tender young boy. Those who do not wish to partake will be offered an alternative"). And it ties in with past and future storylines in a satisfying way--it's fun to see what Guthrie's up to at this point, for instance, and Dredd being insubordinate to Hershey is part of the long-simmering conflict that bubbled over in "Bullet to King Four" last week. That first, double-length episode of "Sin City" is particularly sharp. I love Mr. Sin's song of greeting (any time there's a musical number in Dredd, it's a fine thing), El Muerte's companion announcing "El Muerte said a kind word once and cut out his own tongue to punish himself!," the idea of "de-Megification"... The "Dredd pretending to rough up the informants" scene in the following episode is pretty great too, although the presence of Sin City police does make me wonder what laws they're there to enforce. 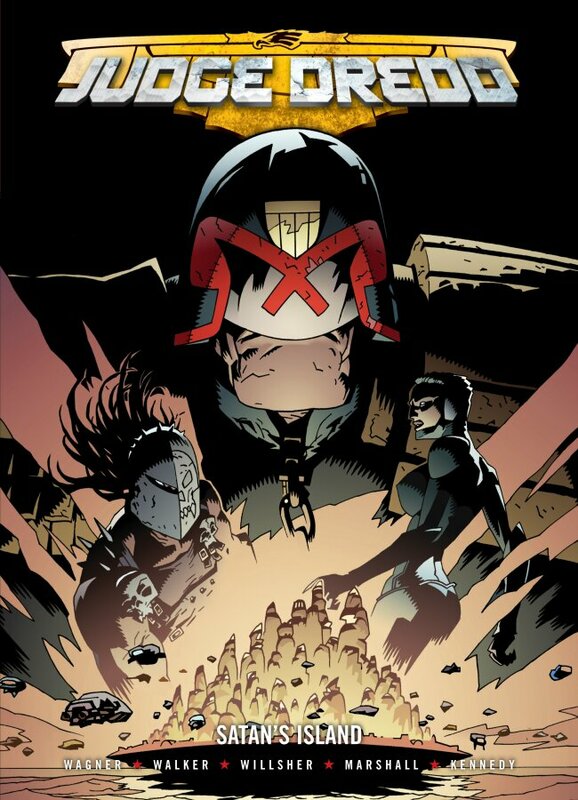 If it were all that good, it'd be one of the best Dredd serials, but as so often happened in this period, it starts wobbling partway through. The plot against the Big Meg is wildly and unnecessarily convoluted: the Sovs get Orlok, for whom they know the Judges are on permanent alert, to deliver the plague to Ula Danser, who can in turn release it in Sin City, so that it can infect people in Mega-City One. Why not simply use an agent nobody's heard of to deliver the bug directly to the Big Meg? 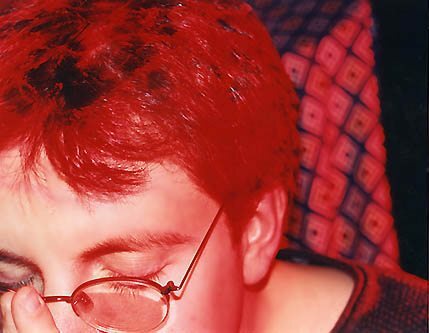 (Which, of course, is what happens some years later in "Day of Chaos.") 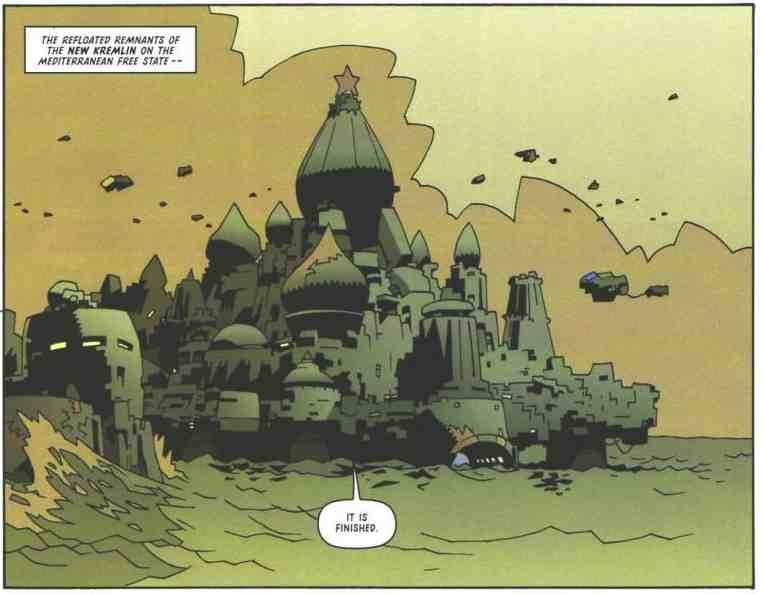 "The Doomsday Scenario" had very strongly implied that Dredd destroyed the entire New Kremlin, but apparently they've somehow gotten a new version up and running. And El Muerte being a Judge gone bad, and Dredd's personal responsibility (in his mind), would be a bit more dramatically effective if we'd seen him before, which I don't think we had--please correct me if I'm wrong. The three follow-ups are all smart and surprising, though, and densely packed in that uniquely Wagnerian way. 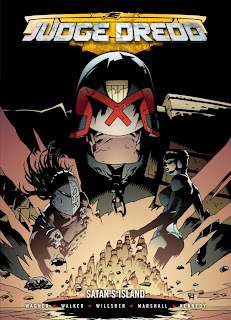 "Case for the Defence" reopens the very good question of whether Dredd's genocide of East-Meg One was necessary, or even did any good for his cause. ("Day of Chaos" is a pretty convincing argument that it did vastly more harm than good even for a best-case scenario.) Setting up some sort of equivalency between Dredd's actions and Orlok's is a fair point, but "you did the same thing!" is hardly a defense. It finally establishes something like the long-missing motivation for why the Sovs would have launched a biological attack and land invasion of Mega-City One in 2104--they'd seen a (contingency?) plan for a first strike from MC1. But it sure didn't look like that at the time, and it's also not clear what either side would have stood to gain from attacking the other. "Reprisal" is an odd duck: it picks up on a thread its artist Paul Marshall and writer Garth Ennis had established eight years earlier in the not-very-good spinoff "The Corps," concerning the Space Corps and its genetic infantry. (Which hints that Dredd is in the same universe as Rogue Trooper, an idea that's never struck me as particularly useful.) Has anything been seen since of Commander Kreig, who doesn't seem to be any relation to Harmony Krieg? It's nice to see a Brian Bolland cover on the first half of "The Trial of Orlok"--his first in almost nine years--but the really extraordinary thing about that story is what doesn't happen in it. The formula for every "archvillain taken into custody" story ever is that the villain makes some kind of last-minute escape, or there's some legal technicality that forces the villain to be set free, or something along those lines. So when Orlok's escape attempt at the end of the story fails and is followed by an on-panel execution, it's a genuine shock: this never happens. It's not "realism," exactly--asking for realism in science fiction always seems like a dubious proposition--but a very smart snapping of genre conventions, and a reminder that the stakes in Judge Dredd stories tend to be pretty high. Next week: Restricted Files Vol. 4, wrapping up the "stories that appeared in British comics that weren't 2000 AD or the Megazine" sequence. 2000adonline (and Barney) have answered your query regarding the best issue of the comic ever. 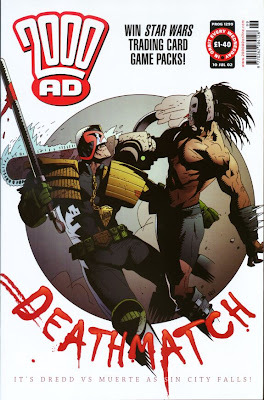 662, apparently: The Dead Man, Dredd (Tale of the Dead Man), Pat Mills's Slaine: The Horned God, Chopper: Song of the Surfer, and Grant Morrison's Zenith (part III). Art by Colin MacNeil, Simon Bisley, Glenn Fabry, Steve Yeowell, John Ridgeway and Will Simpson too. It can't be a coincidence that three fifths of that issue was written by Wagner. 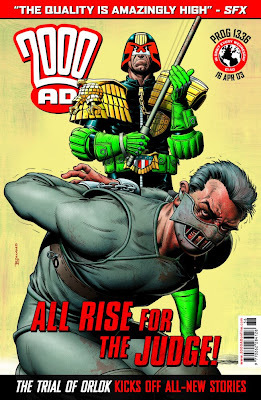 The Dredd/Rogue Trooper crossover (no idea of the prog numbers) established that they are definitely not in the same universe, as Rogue had come through some sort of dimension warp. The story's OK, the main interest in it being that Dredd instantly sides with Rogue and there are various suggestions that this is clone solidarity.